Two cousins. A dark family secret. A looming rebellion. In Regency England, a mysterious inheritance draws Prudence Fairfeather and Lady Josephine Weston out of candlelit ballrooms and into the shadows of insurrection. A newcomer to London society, Prudence longs for the enchantment of love and instead finds real magic in her late mother's ring. But power brings peril, and strange mishaps culminate in an assassin's bullet. Ensnared by the web of a malevolent socialite, Prudence forsakes romance to fight for her freedom. Josephine fears an eternity of confined country life until rampaging trolls, a gang of drunken vigilantes, and a flirtatious officer bring her all the adventure she craves. Compelled by birthright to take up arms, she embraces her newfound, unladylike abilities to shield her loved ones from harm. As danger drives a wedge through their friendship, Josephine and Prudence must face their magical legacy and the enemy who will kill to control them. This book really tickled me. It reads like a historical romance with bits of the paranormal painted around the edges. The reader really gets to know the cousins through their correspondence they send back and forth. Yes this was back in the days where a person would write long letters to keep in touch. Along with the letters, we are privileged to see what is really happening in their lives. I enjoyed being able to see what they did and did not share. There is enough going on with these cousins that there is never a dull moment in the story. The dialogue is witty and the writing is elegant. There is just enough hinted about on the paranormal side to keep the reader entranced. 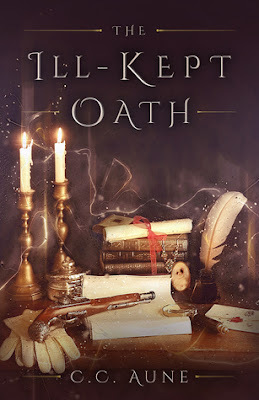 I do highly recommend THE ILL-KEPT OATH to any reader who enjoys historical romances as well as the paranormal. Personally I am hoping that another book will come out in this series as I still have questions.